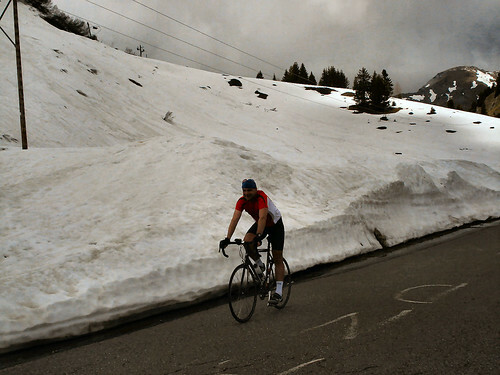 Col de la Ramaz last featured in the 2003 Tour de France. French hero Richard Virenque won the stage and you can still see his name faintly written along the road. This steady climb really becomes steep and alpine after about 8 kilometres with a narrow stretch along the edge of a cliff that — without a barrier — would be almost too frightening to ride. The views get better as the altitude increases and there is a great waterfall off to the right. At Sommant a new valley opens up . Part of Le Praz de Lys ski station. Still a lot of snow at the top and I couldn’t find the col sign. A good climb. I must admit to being rather envious, with a young family I don’t have the opportunity to ride much. Used to race, had an arthroscopy on knee before went to follow the tour in 1993, camped on the Galibier and was green with envy watching the riders ride up the night before the stage! This year I’m taking them to watch a couple of tour stages, one on the Col De La Ramaz and thenext on the Col De La Madeleine. I wondered if you can remeber any good places for pitching a tent on these climbs? They look as though I’ll be able to find a place! Have to try and get there early, looking at a youtube review of the Ramaz it looked busy up there! Who knows as my kids get older I may get more opportunity to do what you are doing! Cheers for the website and any help you can give. 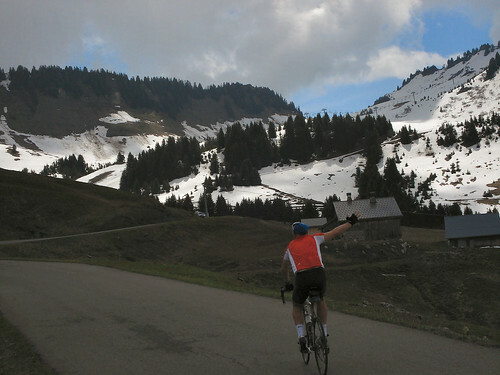 Just short (the last kilometer) of the top of Col de la Ramaz is a very open, large mountain plateau. Should be plenty of room to camp there. For Madeleine, again nearing the top there should be plenty of places – I wouldn’t think you would have any problems.